Why should I pay for training my dog? Well, this is a question I hear a LOT! Imagine if they stood at the supermarket checkout saying “I can’t afford this at the moment, so either give it to me free or we won’t eat till next month”! It’s a question of priorities really. You got yourself a dog. And you’re expecting it to train itself. All those things that annoy you about your dog are not figuring in your list of priorities to fix. But is this a short-term thought? The sooner you get to grips with your new puppy, or any newly-developed thing your dog is doing that you don’t like - the faster you can fix it. For a puppy and a new rescue you have to invest a lot of time in the early months. And your older resident dog? You’ll have to pick up on any new thing he’s doing and decide straight away what to do about it. I know there are a lot of expenses with a new puppy. But people happily cough up large sums at the vet, possibly paying for a monthly program. The purchase price of the dog (especially if it’s one of the popular breeds or a “designer” crossbreed) can be very high. They pay loads for insurance, more for kennelling for holidays, they buy expensive beds and toys, get good food … but for some reason I can’t fathom, think that while their puppy won’t vaccinate himself, shop for himself, or pay his own insurance - he can train himself! Perhaps if people could see what they’re risking by missing out on this, they may move puppy training from “maybe” to “essential and urgent”. It’s not just a question of having a dog who is a good citizen, doesn’t upset neighbours or other dogs, can be trusted round your food and belongings, and is not under your feet all day annoying you. There are real costs involved in abdicating your responsibility in this. She lists lots of examples of occasions where simple training could have saved the pet’s life - and saved possibly thousands in vet care. It can be simple to deal with what people perceive as aggression if we trainers are invited in to help. But we can’t do it by thought transference! We have to show you. It just shows that a bit of knowledge of how to train a dog can turn even the most serious cases round. But why wait till your child is bitten? Why not teach your dog AND your children how to behave round each other from the start? And you should know that if your dog does bite someone, it could end up costing you a massive amount of money in legal fees and fines. In UK law a dog doesn’t even have to bite! It’s enough for them just to frighten someone. Your dog could be taken away from you and killed because you didn’t understand him and his motivation. This sort of expense far outweighs the costs of some simple training! Not to mention the distress all round. You don’t even have to venture out to find that a little training could save a lot of upset and sadness for your family and your dog - and even save your dog’s life. Then there was the bin-raider Debbie came across who ate a cooked chicken carcase and got a blockage - this is a life-or-death issue, and the vet treatment will be urgent and costly. What training would have saved all these dogs? • Recall is an obvious one. It’s not just a question of yelling the dog’s name and expecting a result - it has to be taught methodically! • Correct socialisation with children, management, and education about this new species in your home for the whole family. • Resource Guarding: can easily be made worse by the owner if they plump for a method they saw on the internet that involves challenging the dog and coercion. It’s a simple issue when you know how! • Window-barking can be quickly solved by a bit of in-home management and Impulse Control training for the dog. • And stealing, countersurfing, hoovering - all can be fixed with teaching Impulse Control, and the owner learning to read their dog and manage situations safely. Should I push dog training up my to-do list? From all this you should be able to see that there is a real material value to training your dog! Not only will she become more amenable in the house and on walks, more fun, more rewarding, more entertaining for the children, but you should avoid the catastrophes listed above. You don’t hesitate to get schooling for your child. Why should your dog not get the same courtesy and privilege? 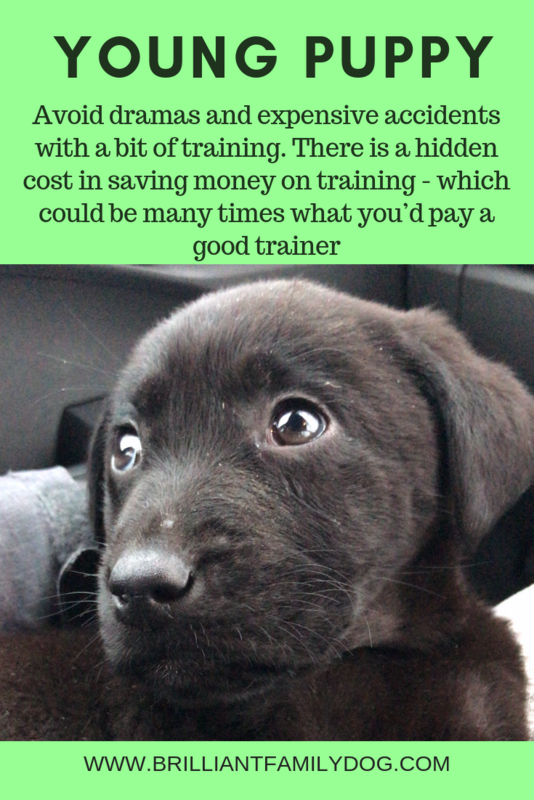 A quick Google search will reveal that the costs of employing a professional force-free dog trainer - whether in group classes, 1-1 consultations, or online courses - is a lot less than you may expect. In most cases it’s much less than what you pay to have your car or your teeth serviced, much less than the purchase price of your dog, and sometimes cheaper than the fancy bed you bought! So have sense and include dog training in your list of outgoings, before your dog makes your life an emotional and financial misery. And do keep in mind that dog trainers - like plumbers, mechanics, and doctors - need to eat and pay rent, and deserve a decent return for all the training and study they’ve put in. But when you can remove all the petty annoyances so easily - not to mention the major disasters - resulting from lack of training, you’ll all enjoy a much better life with your dog. New dog? Resident dog creating difficulties?